My entry into #thelittlereddressproject was not a difficult decision. I didn’t enter last year but really loved seeing all the little red dresses popping up on Instagram, so I was determined not to miss out this year. To give you a brief summary, this is a fun Instagram challenge hosted by Renata from runningnstyle and Rosa from rosabella.angelica. It is basically to make a red dress (or a dress which is at least 90% red), and post your pic onto Instagram. Luckily for me the oxblood red/wine colour that I have chosen is perfectly acceptable in the rules of the competition – phew! I picked up the fabric in Birmingham rag market recently. I met with a couple of friends for a little fabric shopping and red fabric for this project was top of my shopping list. 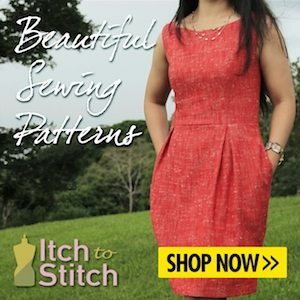 Originally I had planned to make an Itch to Stitch Marbella dress which required a woven fabric, but I just could not find anything that I liked at all. Eventually I picked up this wine coloured waffle knit fabric and immediately I knew I would use if for my favourite knit dress pattern – The Chloe Dress by Pattydoo. I must admit, as it was kind of a second choice fabric I wasn’t over excited about it originally, but now it’s made up I couldn’t be happier with it. The waffle texture is cute and what you can’t see very well in the pics is that it has a subtle gold thread running through it which gives it a lovely sparkle. I have made this dress twice before, once was for a a blog post as part of the Sewisfaction blogger team, and another I don’t think I have written about here but there is a photo on My Instagram grid taken of it back in September. Do head on over to my Sewisfaction blog post linked above if you would like to check out my full review. This version is very slightly different from the last two that I have made in that I finished the neckline with a neck band, rather than using a facing. This gives a more informal look I think, and I actually prefer it now I have made it this way. If you would like some red dress inspiration, then I would encourage you to head on over to Instagram and search the hashtag #thelittlereddressproject – you won’t be disappointed! Thank you to Rosa, Renata and the generous sponsors – Minerva Crafts, Sew Essential, Sewalicious, LA Finch Fabrics, Dressy Talk Patterns, and Cali Faye Collection. Next post: My latest Minerva Crafts Blogger Network make – a cosy Burda 7148 sweatshirt dress. I think this is lovely! I really like the subtle sparkle in the fabric.